Happy New Year! I wanted to start the year off right with my favorite thing to cook: risotto. 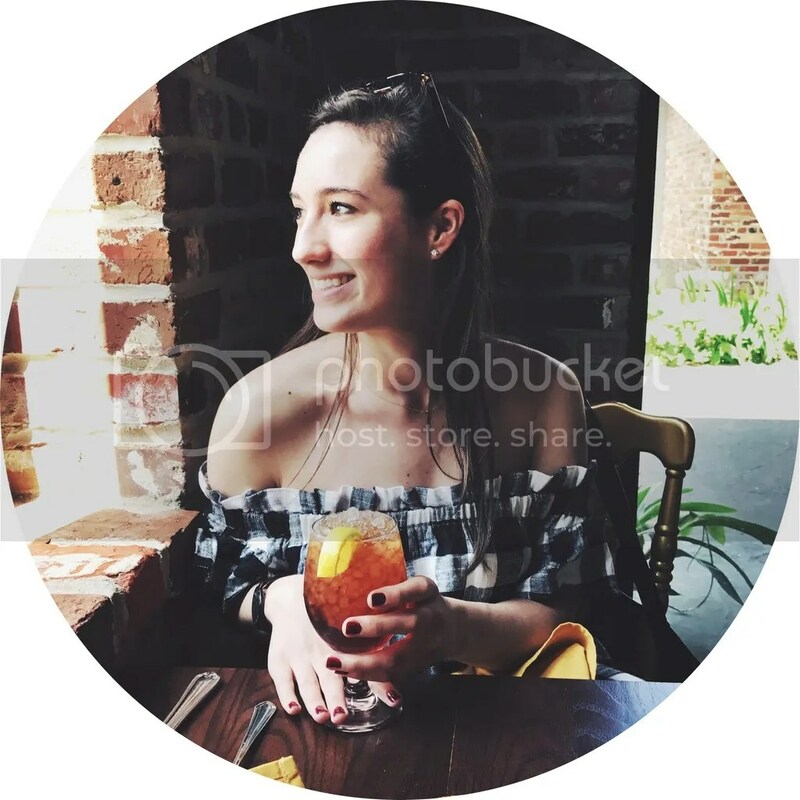 I’ve recently been promoted to chef instructor/host at Taste Buds Kitchen, and my first class is on January 4th (but don’t tell the attendees that!) The theme of the event is Taste of Italy. 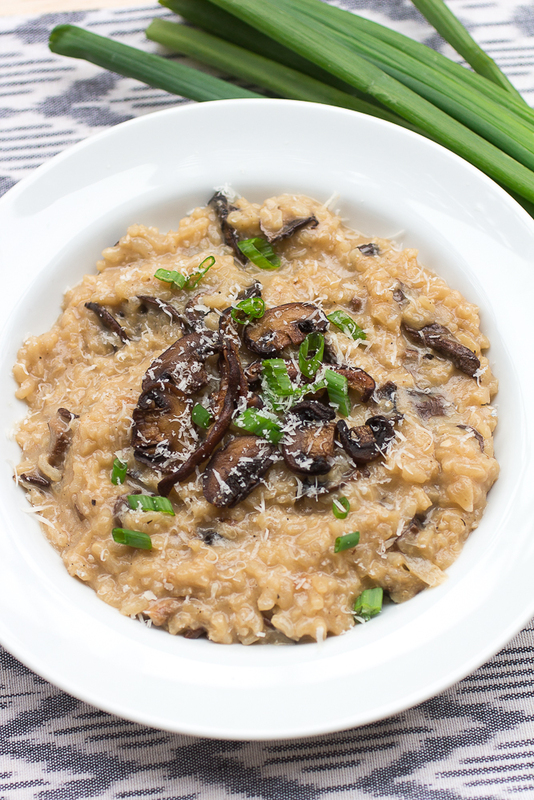 We prepare a delicious truffled mushroom risotto, eggplant parmesan, and baked cannolis. So in honor of my first class, I wanted to give the dusty recipe I learned years ago another try. I’ll never forget the first time I made risotto. When I was a freshman in college, I got the flu and was on bed rest for a week. Normally watching endless hours of the Food Network makes me too hungry to function, but my lack of appetite made binge-watching a breeze. I had a folder saved of all the recipes I wanted to try the second I got my appetite back (and when I went home, of course. 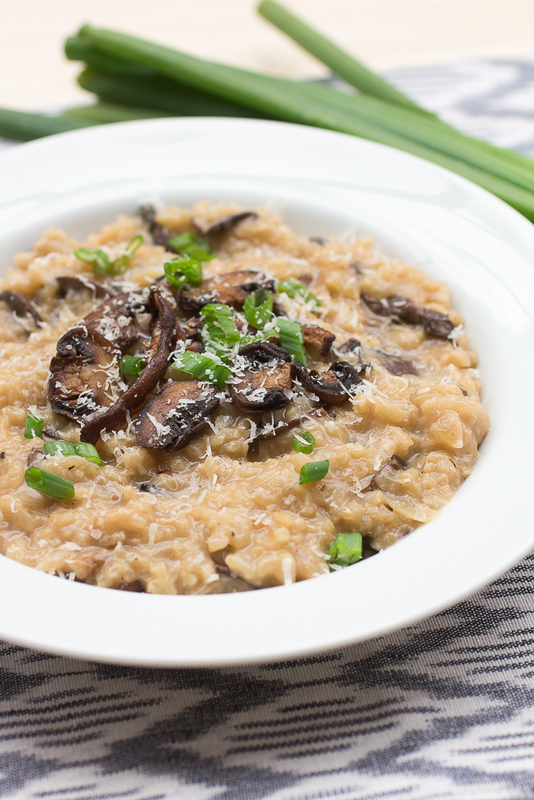 You can’t really make risotto in a microwave). 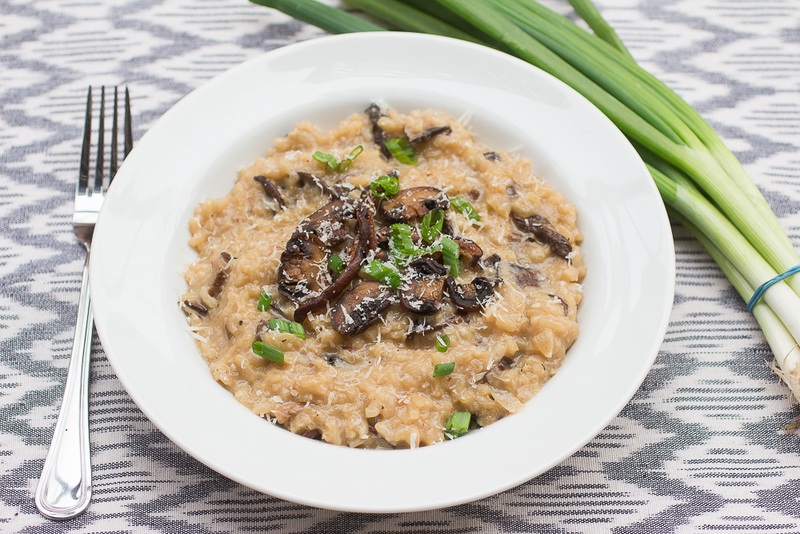 Anne Burrell’s mushroom risotto was at the top of my list. My dad and I made it together for Stephanie, my step-mom’s, birthday. The recipe was enormous, and we had to go to three grocery stores in New Orleans to find all of the ingredients. By the end of the night, I was up to my elbows in risotto, sweating my buns off, dancing around to unnecessarily loud music with my dad (particularly track 2 of the Soprano’s soundtrack: It’s Bad You Know, by R.L. Burnside). It was a blast. 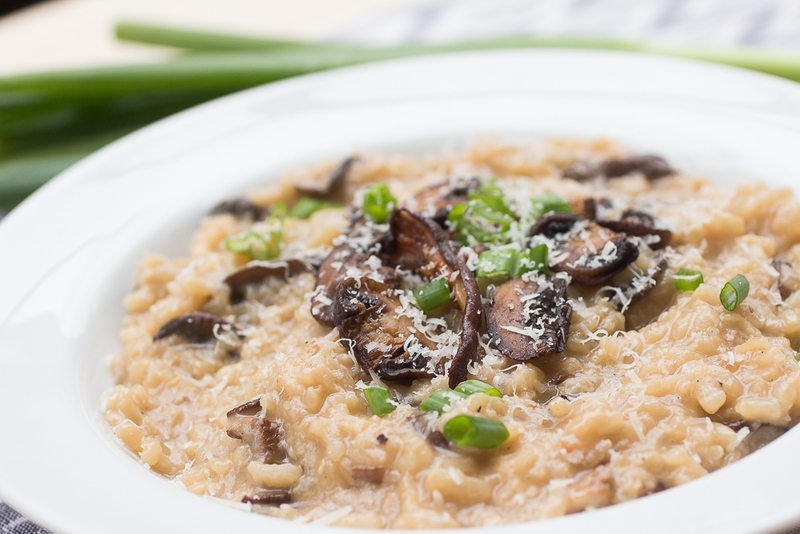 That night is one of my favorite memories, and why risotto is my favorite things to cook. Soak the dried mushrooms in hot water. When they are tender, carefully remove the mushrooms with your hands. Reserve the mushroomy water, leaving about an inch or two of water at the bottom (this is usually filled with sand and other crud). Add the mushroomy water to the stock. At this point you can sauté the rehydrated mushrooms or discard. Over very high heat, add about a tsp of canola oil and sauté the fresh mushrooms until golden. Season with salt and pepper and add a pinch of garlic until lightly browned. Pour into a bowl lined with paper towels. Warm the stock in a pot and keep at a simmer over medium low heat. Saute the onions in 2 T of unsalted butter over medium heat until translucent, about 6 minutes. Add the garlic and cook for 1-2 minutes more. Add the rice and cook for about 5 minutes or until very lightly toasted. Add the wine wine and reduce until dry. Add a ladle of stock at a time until completely absorbed, stirring constantly. Continue to do so until the rice is tender. This should take about 40 minutes. Add the parmesan cheese and season with salt and pepper. At the very end, add the unsalted butter and whisk vigorously until the butter is melted and the risotto is creamy and fluid. Add the sautéed mushrooms (reserve for garnish, if needed) and bring up to temperature. Serve with parmesan and green onions. This was amazing! Such a great recipe, so much flavor. Wow! This looks mouth watering! I just came home from Chicago and had the most wonderful mushroom risotto at eataly and have been craving it ever since. 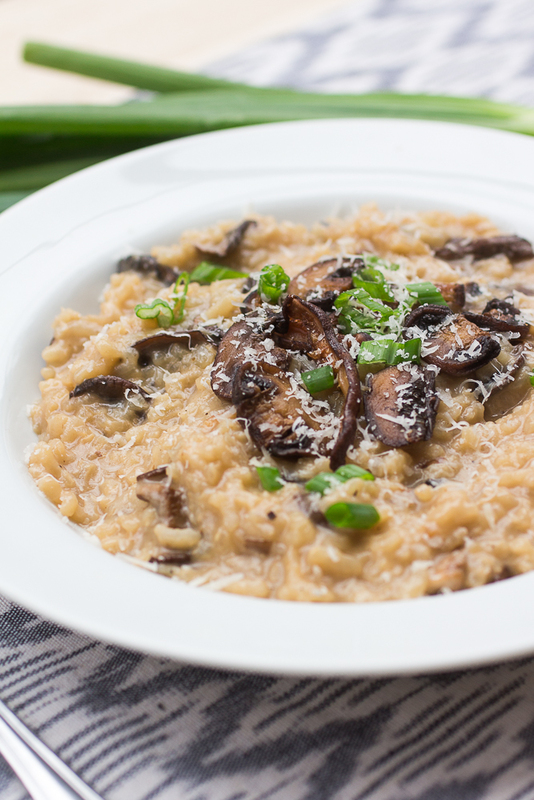 This looks like it will absolutely clear my cravings:) I’ll never forget the first time I made risotto too-I think my arm almost fell off from stirring, but totally worth it? Thanks for sharing! Thanks for the feedback! The first butter is for sautéing the onions and the second addition of butter is to finish to make it creamy and delicious. I’ll adjust the length of time because I definitely don’t want to be misleading.